Chelmsford Town Hall is located at 50 Billerica Road, Chelmsford, MA 01824; phone: 978-250-5201. Photo: Hildreth-Robbins House (Red Wing Farm), ca. 1742, 19 Maple Road, Chelmsford, MA. Listed on the National Register of Historic Places in 2006. Photographed by User:John Phelan (own work), 2010, [cc-by-3.0 (creativecommons.org/licenses/by/3.0)], via Wikimedia Commons, accessed February, 2014. In the settlement of New England the first towns which were planted along the coast had by 1640, when immigration ceased upon the accession of Cromwell in England, begun to extend inland, first to Watertown in 1630, to Concord in 1635, from Charlestown and Cambridge to Woburn in 1642 and from Lynn to Reading in 1644. Up to 1640, when the population of New England had reached 26,000, it was made up almost wholly by emigration from England, but from that time forward the growth of the colonies was almost entirely by the natural increase in population. After a town had been planted and the land taken up, the hardy and adventurous young men who lacked the means to buy land were ready to band themselves with others in like circumstances and resolutely push on and make new homes in the wilderness. The General Court was ready to grant lands for such purpose to men of good character when their numbers promised to be sufficient for mutual protection and for the maintenance of religious worship. Soon after 1650 a few venturesome families took up their abode in Chelmsford, Groton and Billerica where, in a short time, they were joined by a sufficient number to become organized as towns. But the extension of the colony into new towns received a severe check in King Philip's War, and the ravages by the French and Indians which soon after followed, so that fifty years after its incorporation Chelmsford was still mentioned as a frontier town. The first recorded movement looking to the settlement of Chelmsford was made in 1652 by some citizens of Woburn and Concord who petitioned the Court for the privilege of examining a tract of land on the "other side of Concord River." Woburn and Concord were the towns then nearest this tract. There was at this time no English settlement north of this tract, and none as far north on the west. Of the twenty-nine petitioners for the grant of the town, fifteen, over one-half, never took up their abode here, none of their names appearing subsequently in connection with the town. They were John Hosmer, Henry Foster, Richard Griffin, John Smedley, Roger Draper, Wm. Hartwell, Wm. Buttrick, Baptis Smedley, Thomas Briggam, John Hall, Wm. Hall and Wm. Chamberlin. Several of the others who came here did not remain to become permanent residents of the town. James Parker went to Groton soon after 1661, where he became the important man of that town. Joseph Parker, brother of James, went to Groton about the same time, and afterwards to Dunstable. Jacob Parker, another of the five Parker brothers, was the first town clerk, but went to Maiden after 1667. 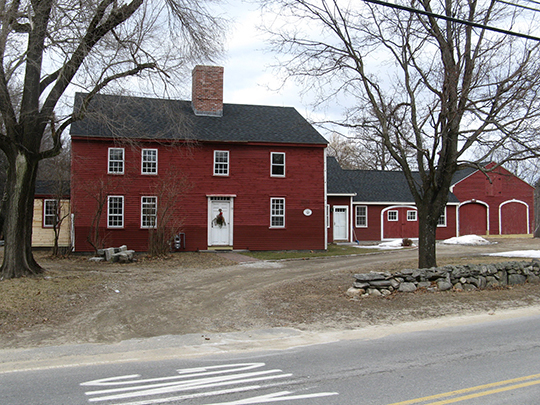 John Nutting was granted a house lot and lands and was here in 1659, but went to Groton in 1661, where he was killed by Indians in their assault upon that town in 1676. James Blood also went to Groton after a little time. The nine remaining petitioners all made homes here and remained during life. They were Benjamin Butterfield, Isaac Learned, Thomas Chamberlain, Edmund Chamberlain, William Fletcher, Thomas Adams, Robert Proctor, Richard Hildreth and Daniel Blodgett. Others whose names are not among the petitioners were here from the first: Abraham Parker, another of the brothers, already mentioned as, perhaps, the first settler. Robert Fletcher and Simon Thompson were also here and, perhaps, others. Reverend Wilson Waters, M.A., B.D., History of Chelmsford, Massachusetts, Courier-Citizen Company, Lowell, MA, 1917.